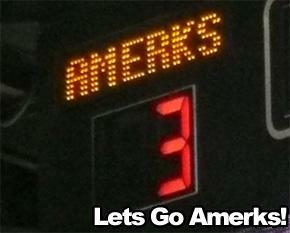 Amerks Need A Goal Against Moose Tonight · Let's Go Amerks! Â The Amerks are again on the verge of entering the record books, this time for longest scoring drought in AHL history.Â Last Friday was a must win to keep the team from taking soul ownership of the record for longest losing streak and they did just that and tied the record. The Amerks have been shutout for three straight games and have not scored a goal in 204 minutes and 22 seconds.Â They have to scoreÂ before there is 5:33 left in tonight’s game or else they’ll break a 69 year old record set by the New Haven Eagles in the 1938/39 season. The Amerks are expected to have Dylan Hunter back in the lineup who has missed six games with a concussion, Tanner Glass has also been returned to the Amerks from the Panthers and will hopefully be able to make it to Manitoba in time.Â Clark MacArthur is still questionable with a hip injury.Â Also no word on whether or not Andrej Sekera made the trip after missing the game against Toronto with the flu. The Amerks havn’t beaten the Moose in four games this season, and eight games total dating back to the 06/07 season.Â They have been able to score goals in the three previous games against the Moose so at least we know they can be scored against. We know that the players are not proud of the way this season has gone and I’m sure they’re aware of the record they are up against so let’s hope they can pull off an upset win. This season has snowballed into one ofÂ despair.Â There has been a lack of consistency, chemistry, coaching, scoring, winning, and the biggest one of all has been a lack of stability on and off the ice. One positive thing that seems to have happened is an improvement in goaltending.Â Adam Dennis was great in net on Wednesday in Toronto and recent play by Tyler Plante has been promising. Now we just need the coaching staff to figure out how to get some chemistry back on offense to score some goals.Â We believe the players have the talent, but when coaches can’t figure out a way to mesh that talent together we get to the point we’re at now. If that can’t happen it’s time for a change somewhere, but given the state of affairs off the ice we probably won’t see anything like that happen in the middle of the season. So the best we can hope for is staying out of the record books. You can listen to tonights game live on Hot Talk 1280 WHTK and B2 Networks.